So to answer the question from last week, I can’t yet break 9:30 for an Ironman. 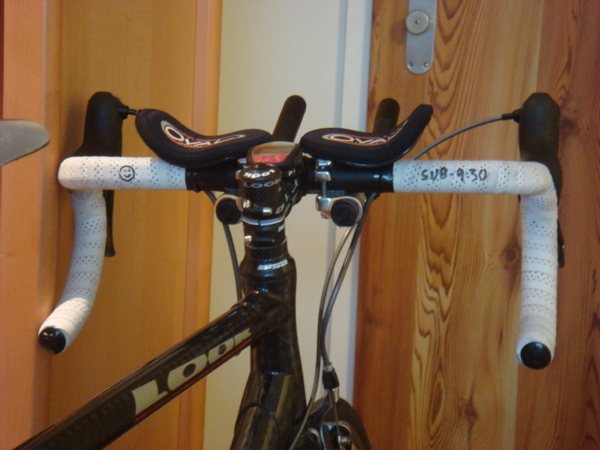 To answer a second question, writing your aim on your handlebars doesn’t help much, but it stays till it happens. Of course the danger of a time based goal is it makes no allowance for course or conditions. Weather in Zurich on Sunday was far from ideal, rain all morning making for a cold and wet bike. Can’t blame it all on that thought things didn’t go to plan pretty much from the start. The plan was to place myself up front and get into a fast group. The reality was I was too far back when we started to go and got stuck amongst the bulk of swimmers. My pace was entirely dictated by those around me and things only started to thin out on the second lap. So straight off I was a couple of minutes off the plan, not really significant in itself, but not a great start. Lake Zurich is great to swim in, really nice clear water and quite warm. In fact with conditions on the day it felt warmer during the swim than on the bike. The swim course was altered this year to include a run over a small island. The set-up did nothing to eliminate the crowding at the turn around, I think the only purpose it serves is preventing any cheating and doing only 1 lap. Given the way cheating was dealt with later, I don’t see the point in worrying about that. The bike was wet. I had to wear a rain jacket, there was no chance of getting away with just your tri kit. The course itself was new for the year with 2 laps including some of the climbs from the previous course, but extending the flat section on the lake. I started out a little hard really, but reigned things back quickly, I was annoyed that my bike computer apparently wasn’t picking up speed. Actually it just decided to show calories instead of speed and on the second lap I discovered I could switch to view my pace. I never felt entirely comfortable on the bike. Throughout the week leading up to the race I had a lot of tightness in my left leg and a stiff ankle. From early on I felt some discomfort in my ITB and down the outside of my lower leg. The flats were OK, but the climbs weren’t going too well for me. By the second lap this seemed to clear up and I felt my pace on the hills improved. Frustratingly on both laps I managed to drop my chain and lose a good minute each time sorting that out. Other than the continuous downpour the other thing I didn’t like about the bike was the sheer amount of drafting going on. Packs formed and worked together constantly throughout the race. I was left to either slow down unable to pass or work hard to go off the front only to be swallowed back up. Marshals were remarkably ineffective, blowing a whistle at the packs whilst riding alongside and not issuing a single penalty that I saw. My overall feeling was that these packs made pacing difficult for me I either had to push more than I wanted, or hold back to avoid being part of the bunch. I will admit that in the last 15k I started to push much harder and was driven on trying to drop a group of 5 riding on my wheel. I can’t help feeling a better swim might have put me ahead of many of these riders and made it less of an issue. Though I also suspect I need to improve my bike some more yet so I am more comfortably travelling faster than the average cyclist. 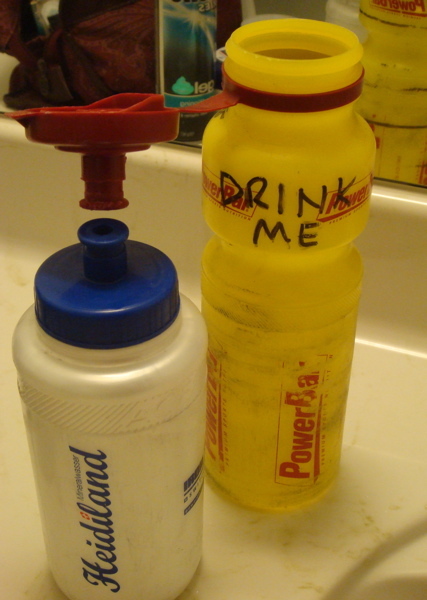 By the way, helpful reminders on gel bottles do work though. The slower swim and bike left it all up to the run if I wanted that sub-9:30 and I’d not left myself much room for manoeuvring. I set out and felt pretty good, that first kilometre was a classic case of going too fast so I eased up and dropped my heart rate. Lap 1 was on plan for sub-9:30 and lap 2 was a little bit slower, but still fine. Then things started to go wrong on lap 3 as I clocked in a few slow kilometres and struggled with a dip in energy. I utilised faster runners to help pick up my pace and keep me going, but there was a limit to what I could do. Watching my pace this closely worked well for keeping my mind in the race and I never slowed due to losing focus. Clearly I was paying for going too hard early on though and better pace control throughout the run would have helped. The final lap I tried to push hard and come the last 5km I latched onto another athlete with 4 armbands and picked up the pace. 2km out and I decided it was time to really push, that last mile was back below 4:15min/km. The race didn’t go to my rough plan. On the day I wasn’t in a state to deliver the sub-9:30 I was hoping for and there were external factors that added to the difficulty. I can’t really say how much, if anything, they really contributed, I suspect I’d not have broken 9:30 in perfect sunshine either. I still believe that it’s possible to do that time right now and have to admit my preparation in the last few weeks of the race wasn’t perfect. Not everything about the race is bad. It was a tough day, not just the distance, but the conditions were certainly some of the worst I’d raced in. I guess all that training in the rain earlier in the year was worth it! I placed 93rd overall and 24th in my age group, both higher placings than in Austria last year. You can’t compare the two races directly, my feeling was that Switzerland was a tougher day than Austria the previous year. Time dulls the pain of these things, but if I’m right then I’ll take home that I am in better shape overall even if on the day I needed to be I wasn’t at my best. What do I think I need to work on? Everything. There’s plenty of room for improvement and once work is out the way no excuses not to try. Specifics – I want to work on the swim and be able to get out of the water faster. I see increased volume and greater focus on endurance particularly in a wetsuit. On the bike I need to plug away at improving the power I can sustain for an Ironman event. If training camps have taught me anything I need to be training with stronger riders more. For the run I will keep working on endurance, but also more focussed pacing efforts once I’m closer to my races. I need to have my paces drilled into me so they’re more instinctive and to stop me going out too hard whilst I’m still feeling good. It’s all in my hands now. Recovery is going well I feel much better than I have done with previous races. I plan to go to the pool tomorrow and lazily swim for a while just to get things moving. Very easy training over next couple of weeks then I’m off mountaineering so I’ll not sit on a bike or get in a pool for a couple of weeks. Two weeks after that I’ll be in Almere for the ITU World Long Course race. I have no idea about what time I’ll do there, but I hope to put a better race together than I did on Sunday. Then it’s Oz and I know they’re desperate for more rain, but I’m not planning to bring it with me this time.